University of Michigan Press, 9780472065318, 216pp. This groundbreaking and important book explores how women of different ethnic/racial groups conceive of feminism. Aída Hurtado advances the theory of relational privilege to explain those differing conceptions. Previous theories about feminism have predominantly emphasized the lives and experiences of middle-class white women. 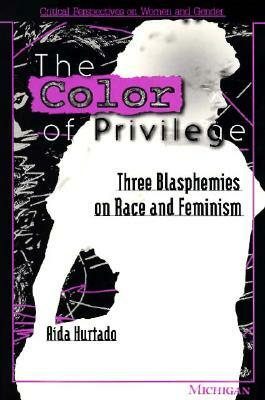 Aída Hurtado argues that the different responses to feminism by women of color are not so much the result of personality or cultural differences between white women and women of color, but of their differing relationship to white men. For Hurtado, subordination and privilege must be conceived as relational in nature, and gender subordination and political solidarity must be examined in the framework of culture and socioeconomic context. Hurtado's analysis of gender oppression is written from an interdisciplinary, multicultural standpoint and is enriched by selections from poems by Sandra Cisneros, Gloria Anzaldúa, Lorna Dee Cervantes, and Elba Sanchez, and from plays by El Teatro Campesino, the United Farm Workers theater group. A final chapter proposes that progressive scholarship, and especially feminist scholarship, must have at its core a reflexive theory of gender oppression that allows writers to simultaneously document oppression while taking into account the writer's own privilege, to analyze the observed as well as the observer. Aída Hurtado is Associate Professor of Psychology, University of California, Santa Cruz.